Wondering how to improve your credit score? Sure, it's easy to fall in love with the idea of buying a home. You've got it all planned out: a five-bedroom home in your favorite neighborhood with a manicured lawn and—why not?—a nice pool. But if you're going to get a mortgage (and let's face it, most homebuyers do), you'll likely need to improve your credit score, also called a FICO score—a simplified calculation of your history of paying back debts and making regular payments on loans. If you're borrowing money to buy a home, lenders want to know you'll pay them back in a timely manner, and a credit score is an easy estimate of those odds. Here's your crash course on this all-important little number, and how to whip it into the best home-buying shape possible. There are three major U.S. credit bureaus (Experian, Equifax, and TransUnion), and each releases its own credit scores and reports (a more detailed history that's used to determine your score). Their scores should be roughly equivalent, although they do pull from different sources. For example, Experian considers on-time rent payments while TransUnion has detailed information about previous employers. To access these scores and reports, financial planner Bob Forrest of Mutual of Omaha recommends using AnnualCreditReport.com, where you can get a free copy of your report every 12 months from each credit-reporting company. It doesn't include your credit score, though—you'll have to go to each company for that, and pay a small fee. Or check with your credit card company: Some, including Discover and Capital One, offer free access to scores and reports, says Michael Chadwick, owner of Chadwick Financial Advisors in Unionville, CT. Once you've got your report, thoroughly review it page by page, particularly the “adverse accounts" section that details late payments and other slip-ups. It's simple: The better your credit history, the higher your score—and the better your opportunities for a home loan. The Federal Housing Administration requires a minimum credit score of 580 to permit a 3.5% down payment, and major lenders often require at least 620, if not more. 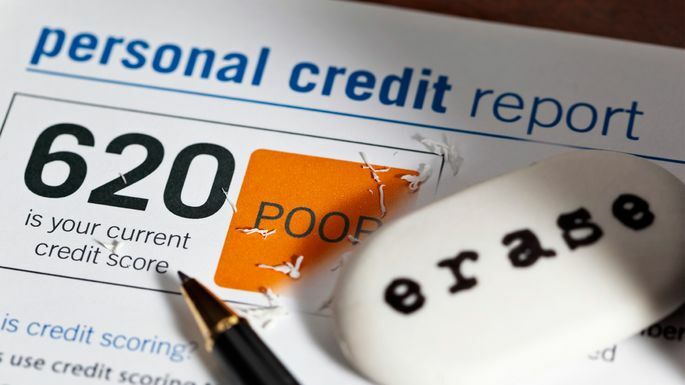 So what can you do if your credit report is in less than shipshape? Don't panic, there are ways to clean it up. A 2013 Federal Trade Commission study found that 5% of credit reports contain errors that can erroneously ding your score. So if you spot any, start by sending a dispute letter to the bureau, providing as much documentation as possible, per FTC guidelines. You'll also need to contact the organization that provided the bad intel, such as a bank or medical provider, and ask it to update the info with the bureau. This may take a while, and you may need documentation to make your case. But once the bad info is removed, you should see a bump in your score. So you've made a late payment or two—who hasn't? Call the company that registered the late payment and ask that it be removed from your record. “If you had an oopsy and missed just a payment or two, most companies will indeed tell their reporting division to remove this from your credit report," says Forrest. Granted, this won't work if you have a history of late payments, but for accidents and small errors, it's an easy way to improve your credit score. One no-brainer way to increase your credit score is to simply pay off your debt. Not an option right now? Here's a cool loophole: Ask your credit card companies to increase your credit limit instead. This improves your debt-to-credit ratio, which compares how much you owe to how much you can borrow. “Having $1,000 of credit card debt is bad if you have a limit of $1,500. It isn't nearly as bad if your limit is $5,000," Forrest says. The simple math: Although you owe the same amount, you're using a much smaller percentage of your available credit, which shines well on your borrowing practices. If you're often late with payments, now's the time to change. You have the power to improve your credit score yourself. Commit to always paying your bills on time; consider signing up for automatic payments so it's guaranteed to get done. Unfortunately, negative items (such as those habitually late or nonexistent payments) can stay on your report for up to seven years. The good news? Changing your habits makes a big difference in the “payment history" segment of your report, which accounts for 35% of your score. That's why it's essential to start early so that you're sitting pretty once you're shopping for homes and find one that makes you swoon. Once you've set your credit on a better path, it's time to tackle the next major hurdle: saving for a down payment.